Over the last few months I've jumped off a plane, hiked on a sheer cliff with a 1,200-foot drop, been flung around the Atlantic Ocean in my attempt to surf, and gone from zero to 20-mile runs to train for the New York Marathon. But nothing literally made my knees shake like today's challenge: taking another shot at getting my New York State driver's license. My first try was a miserable, cringe-inducing flop that brought my self-esteem down a few pegs. Before this test, I thought of myself as a pretty decent driver. I drove practically everyday for over 10 years while I was still living in Manila—and none of this automatic transmission nonsense. I drove a stick shift, thank you very much. So I thought I could pass without much trouble. But instead, I failed miserably without too much effort on my part, and the dressing down that I got from that examiner made me feel about 5 feet smaller (which does in fact only leave me with one inch). In an ideal world, I would've spent the two months until my next test date practicing diligently. But real life is a lot more complicated than that, and I just couldn't find the time what with moving apartments, marathon training, trying not to drown in a deluge of work, my ongoing pitiful attempt to learn Español, and catching up with friends flooding my schedule. So when I went to take my test this morning, I was scared to death. I didn't practice at all and had done nothing in the past months to hammer the habits of turning my head to look and signaling into my psyche. So demoralized was I that I decided I was sick of this bullcrap, and if I didn't pass this time, I just didn't want the damn thing anymore. I was a nervous wreck when I met my instructor Rey from Professional Driving School of the Americas at Madison Park. There was another student coming with us today, a Frenchman named Nicolas. Rey asked me if I wanted to drive to Staten Island. "He can drive," I replied. I just wanted to relax and thought it might be better for me to hear the instructions being given to someone else before having a go myself. So I sat in the backseat as we all shared stories on road trips we've taken, and listened closely as Rey gave Nicolas a simulation of the test. I think it helped me to absorb the instructions without worrying about driving at the same time. When I finally got behind the wheel, it seemed I had finally gotten the hang of signaling and looking left, right and back ad nauseum. The trauma of the first test was apparently enough to get it into my stubborn little head. At last, I got the right instructions on what on earth to do with those darn stop signs ("Make a full stop. If there are no cars, you can slowly crawl to see if any cars are coming. If there aren't, you can go ahead." This makes much more sense than that two stops blabber). My parallel parking was not perfect, but Rey didn't insist on perfection: "You can fix it if it's not perfect. You just need to show that you can park. Just relax and take your time." My driving alter ego Cher Horowitz did attempt to make a comeback though. I found that I turn into Cher once I make a mistake and I get told off. I guess I've just always been a teacher's pet, and I get a mini-meltdown when I'm told that I missed something. From there I just go on a path of self-destruction. I start driving too fast. I blow past stop signs. It was so bad that at one point, I turned on my signal light to make a right turn but kept going straight. My instructor looked at me like I had gone Exorcist right in the car. "Pull over," he said. "Turn everything off and let's start all over again." I took a moment to calm down and reboot. We did the simulation all over again, and this time I mentally locked up Cher in her walk-in closet with a black AMEX, Net-a-porter and Wifi. I drove calmly and carefully. I was good to go. We drove to the test site and before I knew it, it was our turn. "Do you want to go first?" Nicolas asked. "Noooo go ahead, please go first," I told him. Just as the examiner was walking up to us, Rey suddenly says, "You guys don't get to choose who goes first. She does." And wouldn't you know it. Of course the examiner picks me. Before I get a chance to freak out, I am seated, putting on my seatbelts, and adjusting the mirrors. I have a different examiner this time, a tall woman wearing dark sunglasses. "When you think it's safe, you can pull out," she tells me. I turn on the engine, signal to my left, put the car into drive, look behind me multiple times, and when the coast is so clear there couldn't even be a mosquito flying in my lane, I finally pull out. As we approach that damn turn where I caused the examiner to break last time, I slow to a full stop. I wait for what seems like an eternity until I lift my foot off the brake and start inching in to make the right. I exhale a little as I drive on and she says nothing. Knowing that cars exiting from the freeway will start to enter the lane next to me, I look behind me a ridiculous amount of times again. She tells me to make a right turn, I do, and when she doesn't snarl at me I exhale a bit more. She tells me to turn into a residential street and as I do, I see an old lady in a maroon sweatsuit standing by a car in the distance. Good god, is she crossing or what? I thought. I decide it's best to be comically cautious and slow to a complete stop before the lady. "She's not gonna cross, you can go ahead," the examiner said. We get to a dead end and she tells me to do a K-turn. I do it perfectly, remembering every last signal and head turn that I'm supposed to perform. She tells me to parallel park and I do it pretty well, I think. She doesn't even open the car door to check how far I am from the curb, and before I fully put the gear into park she tells me I can pull back out. We drive back to the test site and pull over. She punches some buttons on her machine before uttering those truly divine words, "You passed." I barely hear the spiel about receiving the license in the mail and blah blah blah ... the celebratory fireworks and marching band making a racket in my head are just too loud. I get out of the car and do three tiny jumps of joy, smiling from ear-to-ear. I was done. I never ever have to worry about this damn test again. Now back to the rest of my life ... where will I bungee-jump? I dedicate this achievement to Kate Mawby, who ended up driving almost 2,000 miles on our road trip because of my lack of a license. I owe you another road trip—driving's on me. So it turns out a two-day drinkathon isn't the best way to prep for a 20-mile run. Last week was a tiring and stressful one at work, so even though I had a Sunday 20-miler, I allowed multiple beers to wash my exhaustion away on Friday. The next day, I hauled my carcass out of bed for brunch with Kathryn and Tricia at Harry's, a Financial District spot where an entrée earns you free-flowing cocktails. So we had a river of bellinis with a side of French toast, followed by beer at the bar next door, and coconut margaritas at the bar next to that. The thought of the Sunday 20-miler was floating around in my head, but since the sun was still up I let the alcohol keep flooding my veins. I felt like roadkill by the time we stumbled home. I paid my respects to the porcelain goddess, drank chocolate milk and Gatorade to rehydrate, and hit the sack at 10PM. When I woke up at 5:30 to get ready for the 20-mile Three Bridges/Three Boroughs run organized by the New York Flyers, I felt quite human so I thought I'd gotten away with my drinking spree. But once the running began, I started to inwardly cuss myself out. I felt tired and for lack of a better word, dried up—the exact opposite of how I felt in Staten Island last week. It was not the best way to feel going into my last, toughest and most important long run before the marathon. Twenty miles is an intense physical and mental hurdle to tackle—particularly for a newbie runner like myself. And the run organized by the New York Fliers is not exactly a walk in the park. It's a serious simulation of the New York Marathon, taking you through three boroughs and two of the very bridges that the marathon course goes through. 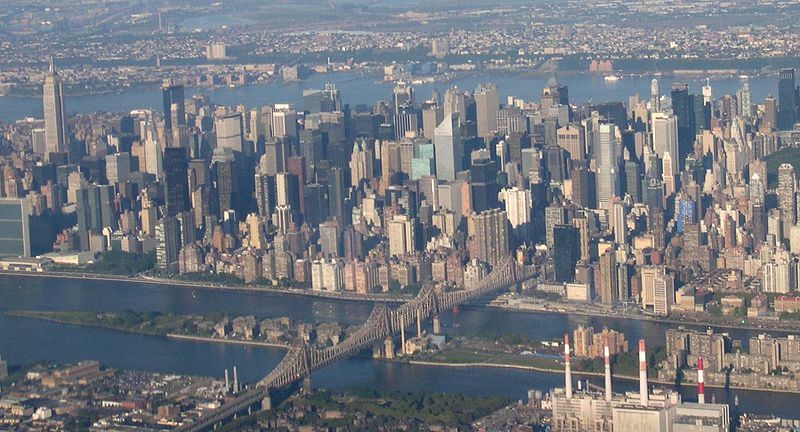 The route hits Queensboro Bridge at about mile 16 just like the marathon course—a segment of the race described by a lot of runners as one of the most daunting. Together with my friends Dwayne, Phil and Jet, I set off with the 10:30 pace group from the Jack Rabbit store on Lexington Avenue between 84th and 85th Streets. We entered Central Park, ran the lower portion of the Inner Loop, then crossed over to the West Side Highway. I was running pretty slow but thankfully, Jet hung back with me. Somewhere on the West Side Highway though, we lost the group and my confidence took a nosedive. Am I really so freaking slow that I've totally lost them? I thought in frustration. Eventually, we found them at a rest stop and realized they'd taken the path by the river while we stayed on the bike path. I felt more relaxed once we rejoined the group but my mental game took a hit. Soon after, we hung a left and made our way to the Brooklyn Bridge. How strange is it that I could never set aside the time to walk on Brooklyn Bridge and now I've gone on it two weeks in a row? As we crossed the Brooklyn Bridge, I started to feel a strange exhaustion set in. My legs were fine and I didn't mind the hillwork, but I was just so tired. It wasn't until we crossed to the other side and got to Flushing Avenue that I realized what the problem was: I was overheating. I'd thrown on a running fleece over my tank top to compensate for my itty bitty running shorts (the previous day's boozefest made me completely forget about buying compression tights as I'd planned). But by the time we reached Brooklyn, I was sweltering. What a difference it made to get that fleece off! It drove home the importance of testing out the clothes I intend to wear on marathon day beforehand. The next glitch in my run hit right when we got off Pulaski Bridge. Since this was an organized run rather than a race, we had to completely stop from running a few times to wait for a stoplight or fuel up on Gatorade and water at the rest stops. The sudden halts wrought havoc on my right knee. I would feel a sharp pain just trying to start back up. When the stoplight changed at the foot of Pulaski Bridge, I failed to launch. I thought I was done for. My right leg simply refused to go back to running and I ended up walking for a good half mile until we reached the last rest stop. Phil walked with me as my heart sunk to a new low. While we gulped down Gatorade under the Queensboro Bridge, I wondered what would happen next. Would I have to get into a cab while the rest of them continued their run? I'd long thought of myself as a creature who prefers comfort over everything else, so I was pretty surprised that I kept on going. When the group started to run, I first walked across the street then started a slow shuffle, seeing if my legs would agree to keep going. The pain started to subside and once I was back in my stride, disappeared altogether. I realized that if I stayed in motion, I could probably get through this. So up I went on Queensboro Bridge to cross over the East River back to Manhattan. The run was actually a lot more pleasant than I imagined it would be. I reveled in the fact that my legs let me keep on running, and soaked up the gorgeous views of Randall's Island and the New York skyline. Before I knew it, we were down the bridge and running on the streets of Manhattan. I realized how fatigued my legs were when stepping over curbs and weaving around the shoppers outside Bloomingdale's felt like a Herculean effort. But as long as I kept moving, I could keep running. When we reached the inevitable stoplights, I woud run in place so I wouldn't have to restart my legs when it finally changed. By doing this, I made it to Central Park. The Outer Loop was completely congested because the annual Breast Cancer Walk was going on, so we had to contend with more weaving through crowds on the last two miles of the run. What got me through this part was my familiarity with the route. I'd run the Outer Loop so many times before and I knew it's every hill and twist. Just a little bit more, I kept saying to myself, you've done this stretch so many times. You can do it now. And just like that, I found myself at Engineer's Gate. When we finally reached that point, it was like someone lit a fire under my tush. I just took off for the Jack Rabbit store, eager to reach the end, stoplights be damned. When I finally finished, I was astonished. Somehow I had made it. I didn't collapse in a crying heap at the bottom of Queensboro Bridge. I didn't have to be carried off in a stretcher. I didn't have to walk or crawl my way to the end of the run. I made it. And I learned some tough lessons along the way. But as my buddy Phil said, "Better to learn them now than on marathon day." 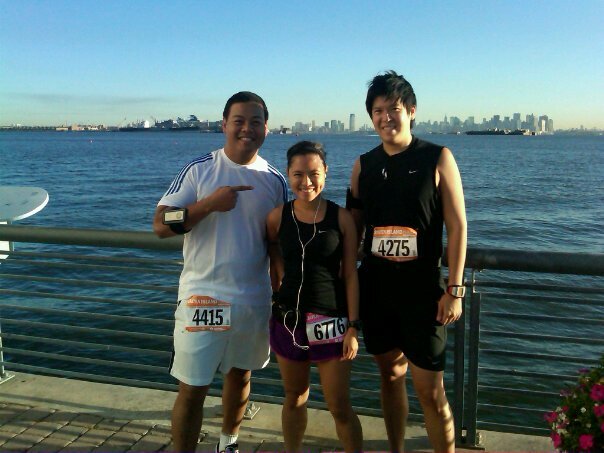 Staten Island Half-Marathon in Sub-2:15! I had been feeling pretty down about my running. I totally wrecked my marathon training plan during my three-week getaway, running only twice in Ibiza and skipping long runs altogether. Our running group's coach, Jud, told me, "You have the option of either (a) running the marathon completely undertrained, or (b) training hard and hurting yourself before you even get to the starting line. I would go with option (a)." That was tough to hear. But he also told me that I had a great time over those three weeks so I shouldn't regret it. Good stuff. So I went back to training but spent most of it feeling a tad paranoid and off my game. I managed a 15-miler on my first week back from Europe but did it slowly and gingerly, trying to feel what shape my body was in. It went pretty well; my legs recovered quickly and I made it through without too much drama. But I still wasn't too sure about myself. I signed up to do the Staten Island Half Marathon at the last minute, and had very minimal expectations of myself. I didn't expect to do well. A few days before the race, my friend Phil told me, "Sub-15 for the SI Half!" I shook my dead with a sad smile and said, "Probably more like 2:45. I'm so out of shape." And I really believed it. So I was pretty stunned when I crossed that finish line, checked my watch and saw I'd finished in 2:12! What in the ... ?!? I don't know what it was—the cooler temperatures, the great course, or that I finally started using GU chomps. But somehow, despite the spotty training and lack of confidence, I ran my best race on this day. I ran straight through, which I'd never been able to do, and did it without feeling like I was just gonna keel over. My stomach dropped to my knees when I saw that massive hill leading to Frank Capodonno Boulevard but it wasn't too bad tackling it. My legs felt fresh throughout and there was no trace of the knee pain that popped up during the Bronx Half Marathon and on my steep downhill hikes in the Grand Canyon. Without feeling like I was killing myself, I shaved almost 6 minutes off my Bronx half time—that's almost 10 minutes off my Queens half time from July! 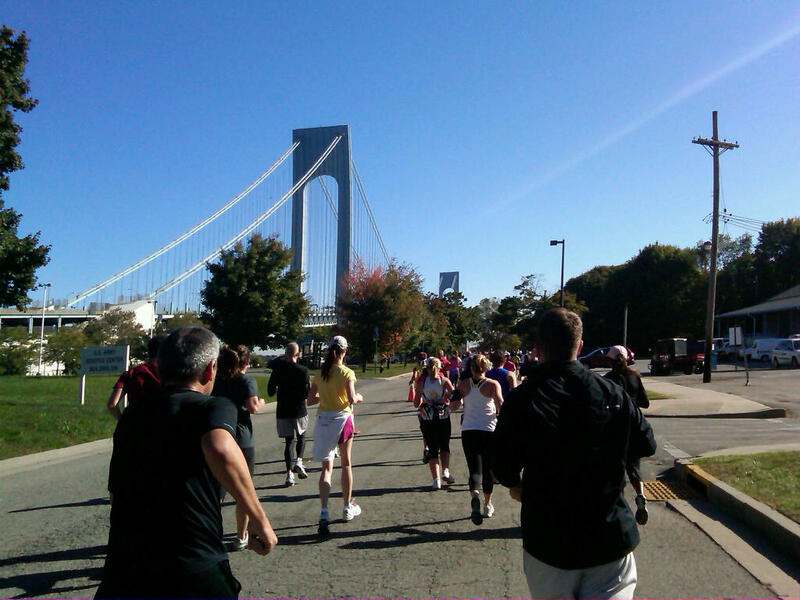 Running in Staten Island made the looming marathon that much more real. Every time we saw the Verrazano Bridge, I felt a lump rise in my throat. In less than a month I would be on that bridge to run 26.2 miles throughout the city. I can't believe we're almost there! 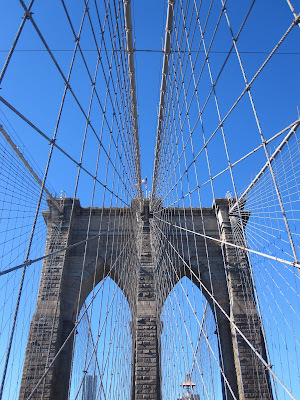 #22: Walk on the Brooklyn Bridge—CHECK! What is it about the human psyche that makes us easily take for granted what's already ours, what's easily available, what we've been blessed to have? 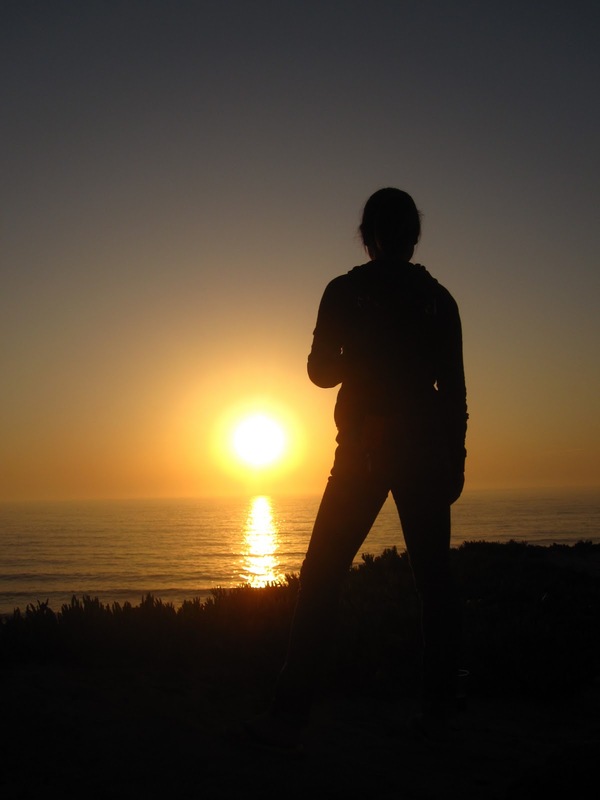 For some reason, we're hardwired to aspire for and chase what we don't have. We only realize the value of what was within our grasp once it's already slipped through our fingers. This applies to far too many drama-filled episodes of my life (and I'm sure, yours too) but since it's so much more enjoyable to be drama-free these days, let's steer this post in a much simpler direction. I've missed out on the best that a place has to offer more than once in my life. I've lived in Asia, Europe and the US over the last few years, and I've repeated the same mistake time and again. I am a big procrastinator and tend to keep putting things off for later until I run out of time and end up with nothing but missed opportunities. I lived in Stuttgart for 6 months but never stepped foot in the Porsche museum. I lived in the Philippines for 25 years and never picked up a surfboard. So when I was writing my 30 Before 30 list, I decided I would make it a priority to do things that I've always wanted to do in my adopted city of New York, rather than keep filing them away for that tricky timeframe called "later." Last Saturday, on a gorgeous autumn afternoon, I decided it was time to cross off an item on my list that's been marinating on the backburner: "Walk on the Brooklyn Bridge." The day started off with a languid brunch at Cafe Luluc in Cobble Hill with my cousin Melissa, her boyfriend Ben, and our friend Chini. After we'd put away the last of the eggs benedict and pancakes, I broached the idea of taking a walk on the Brooklyn Bridge and Melissa decided to come along. Like me, she's lived in New York for the last few years but never walked on the bridge. There we were: two little Filipinas on a mission. 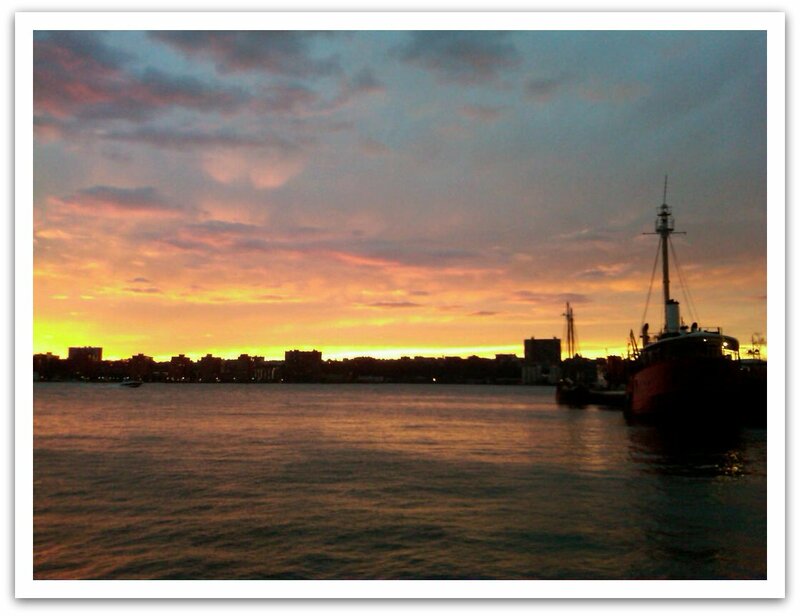 We started on the Brooklyn side and walked towards lower Manhattan, snapping pictures, chatting and taking in the beautiful views. My hair's a mess and I look like I inhaled the entire chicken and not just eggs in the picture below but I don't care. I love it. As runners zipped past me, I realized that I didn't need to cross this off my list and leave it at that. What's stopping me from making walking and running on the Brooklyn Bridge a regular occurrence in my life? Crossing things off my list doesn't have to mean lumping them in the "been there, done that" pile. I prefer the, "I had a great time. Can we do this again sometime?" approach. When I started the 30 Before 30 Project, it was fueled by this need to recapture years I thought I'd lost. It is a wonderful surprise that instead, this little project has given me a life and a future to look forward to. My faithful companion Dusty, the first pair of running shoes I've ever owned, finally gets a well-deserved a rest. My new friend Berry will keep me company during this Sunday's Staten Island Half Marathon and the New York City Marathon in one month! The only thing that hasn't changed? I'm still tricking myself into getting some miles in as soon as I wake up by sleeping in my running clothes. Works every time. Good night and good luck to everyone else hitting NYC's pavements a month from now! The 30 Before 30 Project is now coming at you from another source—the broadsheet! Last Sunday, my first 30 Before 30 article came out on The Philippine Star's On the Radar section. On the Radar features bloggers as writers, and they were kind enough to give my little project some space on their pages. It is such a thrill to be sharing my stories on a major Philippine daily! 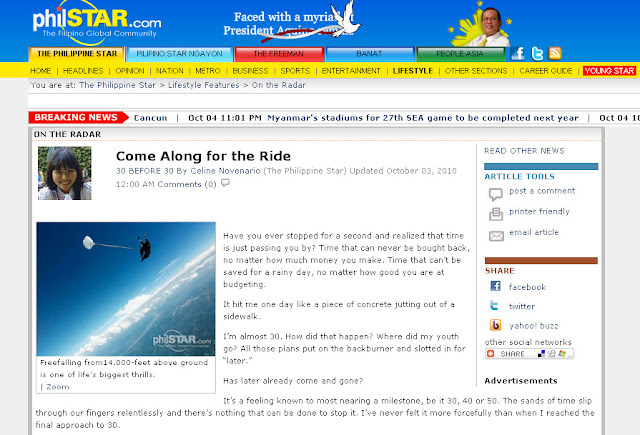 The article is available online at philstar.com. More coming soon! For as long as I can remember, I've been told that I'm hard-headed. I prefer to believe that if we were to ask Jane Austen, she would say I'm "strong-willed." Hard-headed's a pretty good word to describe me though. When I have my mind set on doing something, it's next to impossible to dissuade me. I finally got "injured" doing something cool. I fell off and got hit on the head, as I'd always feared would happen, but I didn't end up floating facedown on the Atlantic. That part of the lesson where they tell you to always hold your arms over your head after falling off the board so it doesn't hit you on the head? Good to remember. In between my throwdowns with surfboards, I had the gift of getting to ride some great waves. It didn't seem like it was going to be that way at first. After the initial smackdown with another student's surfboard, nothing much happened. The water was so flat that Rolf started attempting handstands on his surfboard to keep entertained. The waves that I did get, I didn't do such a good job of riding. The afternoon session didn't seem promising either. I woke up from my siesta to find a thick fog hanging over Ribeira d'Ilhas and was convinced the lesson would be cancelled. But in we went, with one instructor responsible for five students and what seemed like just 10 to 15 feet of visibility. I had this nagging voice in my head that kept saying, "If you get knocked out unconscious, they will never find you in this fog." But it actually ended up being one of my best sessions. I finally learned how to cope with the big waves when they came and learned where the calmer parts of the water were where I should paddle through. I found spots outside to rest while waiting for my turn where it was less likely for waves to break and tumble me towards the shore. And I was reassured when, the one time I took longer than usual gettting back outside (due to riding a big wave, losing a shoe, finding it but not having time to put it on, and then having to paddle back outside while balancing a shoe precariously on the board), our instructor Alex immediately noticed my absence and called out for me. Feeling more confident in my ability to paddle out made my afternoon session a lot better. 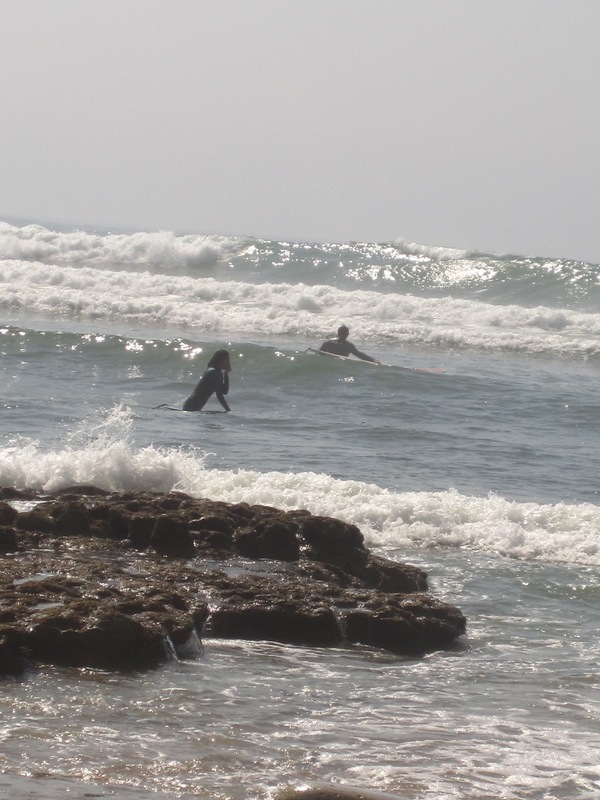 I surfed a lot of good waves and enjoyed the experience more after getting the hang of paddling. It was such a great session to end my stint at Ribeira Surf Camp. My last night at the surf camp was a quiet one. Tiago treated Rolf, David and I to some Sagres and showed us pictures of sick waves he's caught around Ericeira and other parts of Portugal during winter, when the waves can reach intimidating heights. We finished our beers underneath the stars at the bar's second floor overlooking Ribeira d'Ilhas. It was the perfect nightcap to an awesome day of surfing. It still astounds me how amazing this surf camp leg turned out when it was pretty much a shot in the dark for me. I'd only found the place through the recommendation of a complete stranger and decided to go for it on blind faith. And yet it all turned out brilliantly. I've met so many fun, interesting and genuine people, and I know that some us will stay in touch and reunite somewhere, somehow in the world. I couldn't have imagined having a better time. And I can't wait for the next opportunity to surf again. Three things happened on my third day at Ribeira Surf Camp. Since my little project started, I've incurred a few minor injuries—sadly, injuries with zero street cred. I skydived and got my tush back on the ground without getting a single scratch. The next day I ran into an open CD-ROM tray in my work cube and got a bloody gash on my shin. I did steep hikes with sheer drops at the Grand Canyon and Zion National Park. My only injury? A stubbed toe while walking to the car to get matches. At the surf camp in Ribeira d'Ilhas, where I was getting hammered by waves and walking on an ocean floor dotted with rocks and sea urchins on a daily basis, I ended up with a painful blister underneath my big toenail. The cause of this gnarly injury? Walking into the breakfast area half asleep and forcefully stubbing my toe on a shallow step. So that was how my day started out. By incurring a painful but terribly unexciting injury. The rest of the morning was pretty unexciting. Eduardo changed my board and I just couldn't seem to find my balance all morning (yes, I choose to blame the board). For the most part, I drank lots of saltwater and got some practice paddling. Before the end of the session though, I did get to ride one gorgeous wave. I rode it to the cheers of Philip, another instructor, and the beginners class he was teaching. The high was enough to keep me smiling all afternoon and lure me back into the water the next day, bum toe bedamned. That afternoon Rolf, Melli and I decided to take a break from surfing to tour Sintra, a lovely little town near Ericeira and Lisbon, declared "the most beautiful in the world" by Lord Byron. The entire town is a UNESCO Heritage Site, and makes you feel like you've walked into a fairytale storybook with it's beautifully preserved Romantic architecture. It was one of my favorite places in Portugal. We went into Palácio Nacional de Sintra, the summer palace of Portugal's kings, to gawk at the lavish furniture and intricate azulejos all over the interiors. The spot I loved the most, however, was the Castelo dos Mouros, which was high up on a hill with stunning views of the Old Town. The castle itself was like a compact Great Wall of China. Just gorgeous. #3: The Impromptu Dance Party. It was Melli and Magda's last evening at the surf camp, and it seemed like it would be a calm one. I should've known that these two Austrian firecrackers were bound to go out with a bang. Stuffed from the delicious octopus dinner whipped up by the camp's amazing surfer/cook Luca, we were chatting over caipirinhas and Sangre beers at the bar when out of nowhere, the girls got up, started blasting dance music, and tearing it up! I looked worriedly at the bartender, who had already started cleaning up and thought, oh no, he's gonna be pissed. Except he wasn't. He leaves the bar and starts dancing too! And then I saw Tiago look in to see what all the ruckus what and thought, oh, he's gonna shut this down. Except he didn't! He just started closing up the doors and windows, grabbed a beer, sat down, and let the dancing continue. Rolf and I looked at each other stunned at how things had gone from one extreme to another in five minutes. "Should we join them?" Rolf asked. "I guess so," I answered. And the rest was history. Bright and early at 9am, I joined four other students for the morning surf session: dynamic Austrian duo Melli and Magda, and smooth Swiss surfers Noemi and Rolf. They had been at the camp for a few days now, with Noemi and Rolf on the last leg of a European surf trip. I was clearly the runt of the pack. But since there was only one teacher, I didn't have a choice. I had to join them outside—farther into the ocean and past the white water to catch the waves when they actually break. I got thrown into the deep end. The good news: I was doing pretty well at surfing. I stood up on every wave I was pushed out on and got the prize of riding the waves for a longer time now that we were out farther. It was brilliant. It was exhilarating. The bad news: I was clueless at navigating the water and pretty shite at paddling. I hadn't figured out that waves come in sets, so after falling off the board, I would try to paddle back out right away even though there were still waves breaking. So I alternated between getting thrown around like a rag doll and paddling in place like a hamster on a wheel. Thankfully Eduardo spotted me most times and rescued me from ... well, myself. "Can't someone just make a machine that paddles for me? Or maybe tows me back outside?" I said to Eduardo as I huff, puff and paddle. He laughed and said, "You don't know how many times I've heard that." Somehow though, every wave ridden magically erases the drudgery of paddling, so I finished the lesson in high spirits. "You're doing really well for just your second lesson," Eduardo tells me. The teacher's pet in me jumped up and down. The afternoon session, however, was another story. It was the last Sunday before school began and the camp was crawling with local surf students. The water's littered with students as inexperienced as myself, and I find that the possibility of colliding with another student scares me more than the waves. My worry was misplaced (on this day, at least) because in the end it was the water that got me. I was chilling on the board waiting for my turn when the swell brought a massive wave. As it started to crest over my head, the only thought I could muster up was, "Uh-oh." Eduardo saw the wave coming at me and thought, "Bye bye Celine. See you on the beach." I felt like a sock in the spin cycle as this wave and those that followed flung me all the way to the shore. Exhausted, I called it a day and spent the rest of the session hanging out on the beach with Melli. We capped off a full day of surfing with a couple of bottles of wine and some good conversation on top of a cliff overlooking the water—Noemi's "farewell party" before getting on a train back to Zurich the next day. 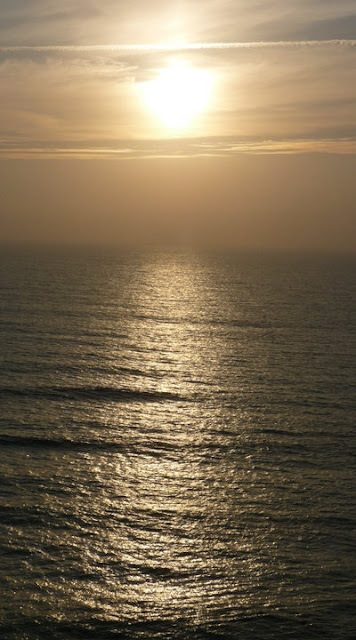 As we watched the sun set over the surfers bobbing in the water and traded all our random stories, I couldn't believe what an amazing time I was having. To go into an adventure alone and somehow end up having more good times with very cool people is one of the coolest rewards of taking a risk. If only for these great unexpected experiences, this little project of mine is definitely turning out to be worth every effort. By the time I left Ibiza for Lisbon, I had a case of the Wanderer's Blues. Exhausted from a week-long American road trip followed by a week-long party in Ibiza, the last thing I felt like doing was going on a solo adventure to a country I've never been to and attempting to pick up a hobby I wasn't sure I'd like. Normally, my default setting is on "wanderlust," but all I wanted was to hitch on the first flight back to New York, veg out in my room with Chinese takeout, and maybe venture out for a run in Central Park. But there was no turning back, no escape hatch in sight. I had already wired the down payment for five days at the surf camp. It was a good thing I couldn't get out of it because had I backed out, I would've missed one of the coolest experiences I've ever had. I couldn't see the light at the end of the tunnel though when I woke up from my siesta. I felt sick and tired. I couldn't imagine how my first surfing lesson could turn out well when I felt like crap before I even started. But at 6:15, I begrudgingly headed to reception where I met my instructor Eduardo, a cute Italian boy with sun-bleached blond hair and blue eyes framed with thick blond-tipped fringe. He looked up from his laptop with sleepy eyes and told me we had to wait because the waves were still too high. I wondered how this could possibly go well with an exhausted student and a sleepy teacher. I didn't have to wait too long to find out. Soon, Eduardo says it's time. I squeeze into a wetsuit (a kid's size 16, unsurprisingly), warm up, and get instructions on the proper way to get up on a surfboard. I try it a few times and then we grab the board and walk towards the water. I guess all those hikes on rocky paths were good practice, I thought, as we navigated the rocky and slippery path to the cove. I'm not gonna lie, I was a little freaked out. I'm not easily scared (see Exhibit A and Exhibit B) but surfing has always intimidated me. For one thing, I'm not used to swimming in the sea because a lot of places have dangerous undertows in the Philippines. Second, I felt threatened by the surfboard. It's so big (and I'm so tiny) that I need help carrying it. So I worry that at some point, I'll fall off, this massive thing will hit me on the head and knock me out unconscious, and I'll just be found floating somewhere in the Atlantic. But the fear dissipates quickly because I've lucked out again and get a one-on-one beginner's lesson with Eduardo. With his attention focused on me, I can block out my crazy fears and concentrate on the task at hand. For my first lesson, we stay in the white water, where the waves have already broken but still generate enough power to carry the board. It's a good spot for beginners to get used to the feeling of riding a wave. Eduardo pushes me out on wave after wave, and at first it seems like all I'm accomplishing is swallowing lots of salt water. He tells me I'm jumping up too fast. I need to relax and go through each step without rushing. And then, as if someone flipped a switch, it happened. With a push from Eduardo, I paddled out and when he said "stand up", I slowly but surely raised my body up, put both feet on the board, and rode the wave. Holy freakin moly, shouted my brain, You just surfed your first wave! Before I got too close to the rocky shore, I jumped off the board and into the water, and turned to see Eduardo with his arms raised victoriously. We did it! At that moment, the exhaustion just evaporated from my body. I paddled back out to him with newfound energy. As we drifted in the water waiting for the next wave, the sun set, the thin sliver of a new moon began to shine, and the clouds turned a beautiful pink. I see how people fall in love with surfing. It is so peaceful, just floating on the water under this gorgeous sky. Eduardo keeps pushing me out on the waves and by the end of the lesson I've gotten the hang of getting up. We call it a night, and by the time we get back to the camp I can't find a trace of the exhaustion and mild depression I'd been carrying for the last few days. No part of me feels the slightest bit homesick now. All I can think of is getting up for my 9 am surf lesson. I grab my keys from reception and my thoughts are interrupted by Jonas, a Brazilian surfer staying at the cabin across mine, who had wished me luck before going out, seeing that I was a newbie. "It was great," I replied. I gave him a big smile and walked back to my cabin, feeling positively high. This is how addictions begin. Photos by Noemi Bertel, who happened to be at the top of the cliff enjoying the sunset while I took my first lesson! "You're from the Philippines? And you came to Portugal to learn to surf?" Tiago, one of the owners of Ribeira Surf Camp, asked incredulously as we got acquainted on the drive from the Ericeira bus stop to camp. "I know, I know," I answered sheepishly. "I should've learned how to surf there but I moved to New York four years ago and never got the chance to do it." "I've never been to the Philippines but my friends tell me there's great surfing there," said Tiago. Over the next five days, I would have several different variations of this conversation at the camp—which is precisely why learning how to surf landed on my list. Too many times we tend to take things for granted when they're accessible. People come from all over the world to the Philippines just to surf our waves. But I lived there for 25 years and never saw a drop of Siargao's waters. So now I'd gone the opposite way as Ferdinand Magellan to make my own discoveries on his shores. Oh well, at least I'd get to try the surf camp's famous pizza, glut myself with more Fanta, and learn to surf surrounded by cute European boys. 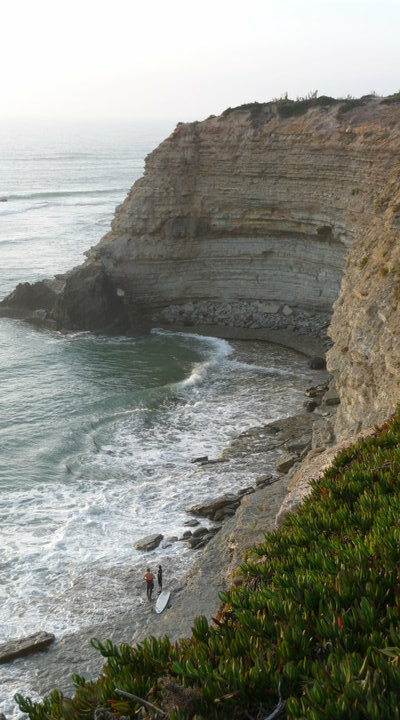 I was tired and a little homesick when I got off the bus at Ericeira. But when Tiago pulled over at an overlook to show me the view of Ribeira d'Ilhas and the camp, my exhaustion gave way to something resembling excitement. I breathed in the salty air and soaked up the view: the water rippling with waves, the tall cliffs surrounding the beach, the surfers floating on the ocean waiting for a wave. Wow. This was really happening. I was really in Portugal, and I was going to learn how to surf. I spent most of the afternoon in a state of disbelief that I'd somehow ended up in such a cool place. See, nobody that I knew had ever gone to Portugal to surf (I was literally the first Filipino to step into this camp) so I booked this place on the recommendation of a stranger and then went off all by myself. I'm not much of a gambler (I won't even gamble a penny at the slots) so to go all in and win in this case was a bit of a shock. I wasn't expecting much in terms of accommodations but was pleasantly surprised. I booked a 3-person bungalow and expected to room with others, but since it wasn't busy when I arrived, they were kind enough to let me have the bungalow all to myself. That little shack is almost unbearably cute. 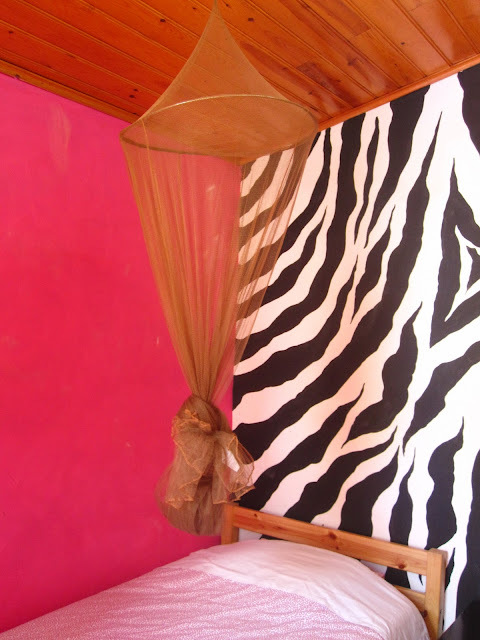 Inside, the walls were painted a girly bright pink, save for one wall done in zebra stripes. From the lilliputian size to the stylish theme, it almost felt like the bungalow was made for me. 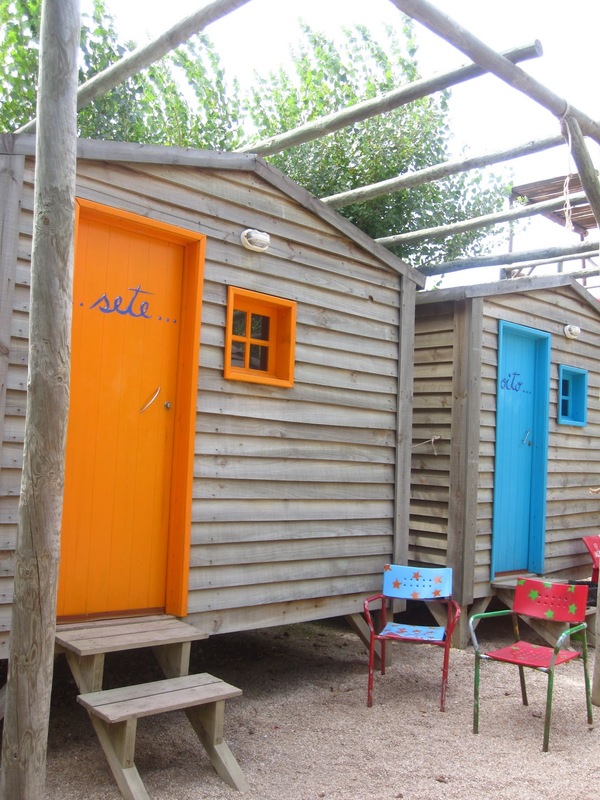 The showers and toilets are housed in a separate area from the cabins, with two cabins sharing a shower and toilet. To my relief, everything was extremely clean and the sheets and towels provided were fresh and new. I could've easily stayed in this camp for a week. After settling in, I finally succumbed to my growling stomach and irrepressible curiousity. I ordered that pizza that everyone kept talking about and got this €4 mini salami pizza masterpiece. I still think about that wood-fired oven-cooked, crisp, paper-thin crusted pizza with fondness. It really is scrumptious and was only made better by the siesta that followed. I needed to store up some energy after all since at 6:30PM that very night, I was going to take on the Atlantic Ocean for my very first surf lesson.